Mellka is a Hero in Battleborn. She is unlocked at Command Rank 34 or by completing the Story Mission The Heliophage. Enemies afflicted with Venom suffer increased damage from Mellka's melee attacks and Claw Lunge. Mellka's machine pistol envenomates targets on hit. Reloading launches a venom canister that explodes on impact. Exhaust the clip to deal more damage. 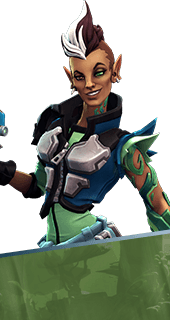 Trained in the elite Eldrid unit known as the Vigilant, Mellka is a versatile and nimble assassin, utilizing her weapons in concert to control the tide of battle. Lunges forward a short distance for a powerful claw strike dealing 187 damage. Can lock onto nearby targets. Charges a burst of energy that deals 280 damage to nearby enemies, and launches Mellka into the air. Launches a player-guided missile that deals 750 damage. Reactivating the skill in-flight triggers early detonation. Enemies hit by Claw Lunge are slowed for a brief time. +3 Seconds Slow. Enemies hit by Spike are slowed for a brief time. +3 Seconds Slow. Spike leaves behind an area of effect that envenomates nearby enemies and deals damage-over-time. +28 Damage Per Second. Mellka's off-hand melee attack propels her backwards. Can be used once every 3 seconds. Claw Lunge launches a blade at the end of the lunge, dealing additional damage. +70 Damage. If Mellka hits a target with Claw Lunge, she will bounce backwards. Meleeing enemies afflicted with venom increases Mellka’s health regeneration rate for a short time. +7 Health Regeneration for 4 Seconds. Killing an enemy afflicted with venom grants a stack of increased health (to a maximum of 10 stacks). Health stacks are reset upon death. +30 Maximum Health Per Stack. Increases Spike’s area-of-effect radius. If the Parting Gift augment is active, its area-of-effect radius is also increased. Increases Claw Lunge dash distance. +50% Dash Distance. Increases Machine Pistol magazine size. +10 Clip Size. When a new target is envenomated, Mellka's movement speed is increased for a short time. +30% Movement Speed for 5 Seconds. Activating Claw Lunge increases Mellka’s melee attack speed for a short time. +20% Melee Attack Speed for 8 Seconds. Claw Lunge deals increased damage. +30 Damage. Blade Launcher blades bounce off of the environment and home in on envenomated enemies instead of exploding on impact. Blade Launcher fires a single, powerful shot, dealing heavy damage to one target. +700 Damage.